were being treated since the fall of her ageing husband. 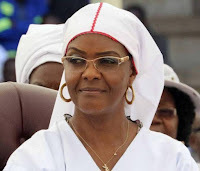 Meanwhile according to The Zimbabwe Independent, although the Mugabes seemed to be quiet in the public domain, the former first lady has been complaining behind-the-scenes about how her family and the families of her allies’ were being treated. Grace has complained to President Emmerson Mnangagwa and Zimbabwe Defence Forces commander Constantino Chiwenga through mediators, Catholic cleric Father Fidelis Mukonori and former Reserve Bank of Zimbabwe governor Gideon Gono, the report said. In July this year, Grace reportedly moved to expand her Mazowe “empire” in Mashonaland province by grabbing the “iconic state-owned Mazowe Dam – almost a century after it was built – and surrounding tracts of land”. The move at the tie heightened her “bitter fights with local villagers”, who were barred from using the huge dam, as she also wanted to privatise it. Grace’s empire included a huge double-storey mansion, a dairy farm, an orphanage and a school. She also had plans to build a university. But as the Zimbabwe Independent reported on Friday, Grace was now complaining about threats to her businesses and property, citing the terms of the agreement secretly reached as part of the deal for Mugabe to resign. Mugabe was reportedly offered a $10 million lump sum payment, full monthly salary, medial cover, security as well as protection of his private properties, as part of a deal that led to his resignation. The nonagenarian was also granted immunity from prosecution. Unnamed sources said that the former first lady was upbeat about disruptive activities around Manzou, Sigaru and other farms which they owned as a family. The Mugabes were also now scattered all over the world with the two troublesome sons Robert Junior and Bellarmine Chatunga and nephew Patrick Zhuwao being held up in Johannesburg. Their daughter Bona, son-in-law Simba Chikore and grandson Simbanashe left for Malaysia on Friday last week. Bona was said to be expecting her second child. Grace’s allies and former cabinet ministers Jonathan Moyo and Saviour Kasukuwere who sought refuge at the Mugabe’s house, the Blue Roof after the army intervention, had also left the country. The two are now believed to be in Kenya with their families who fled after a military raid at their family homes soon after the takeover. President Mugabe, his wife Grace and her son Russell were the only ones who were still in the southern African country.